I was sorting out my wardrobe the other day (which doesn’t take long as I actually don’t have that many clothes!) all the summer stuff got packed away and all the winter woolies etc brought out. It gave me chance to have a long hard look at my wardrobe and decide where the gaps are. I decided I need more winter skirts and shirts…and cardigans! I went to my sewing room and pulled out a length of purple wool from my stash, I think I bought it in Goldhawk Road last year. I must admit on the shelf it didn’t look that exciting, even a bit drab, but actually once I pulled it out and looked at it it’s a lovely length of wool, it has a ‘running stitch stripe’ in grey, but like many wools the purple is made up of lots of different shades of purple which give it a beautiful depth to the colour. As I was on a mission to increase my wardrobe I decided on a trusty pattern I knew I could make up easily and quickly. I chose Burda 8765, it must be the 4th time I’ve made it this year, it’s a good staple pattern for a straight skirt with a kick pleat. I often think the photo on the front of the pattern really doesn’t sell it! 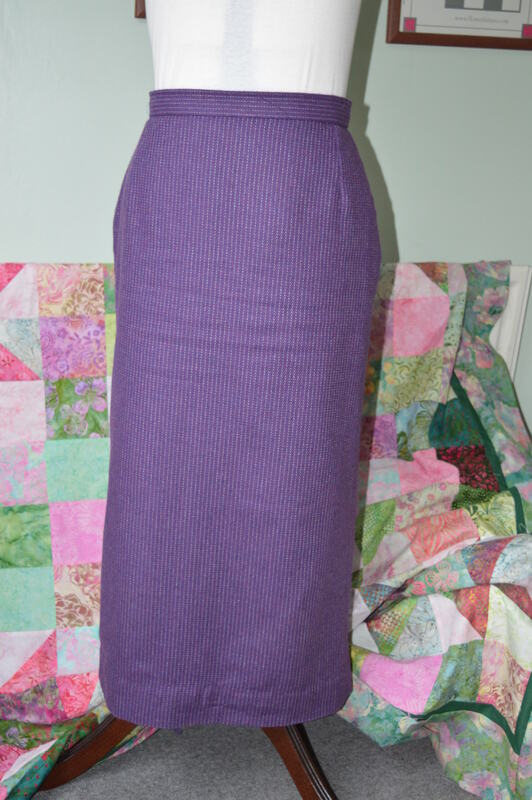 I cut it out carefully to try and ensure the stripes stayed true to the line of the skirt. I was pleased to see my darts were straight with the stripes. I made it slightly bigger on the hips this time as my red and green plaid one is a bit snug! It goes together really easily and quickly, the instructions are concise but clear. 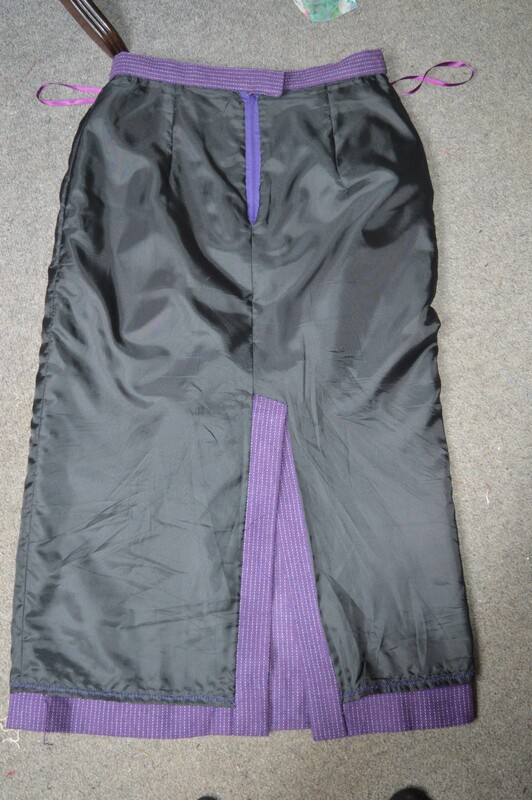 It’s fully lined and the lining is stitched round the pleat so it hangs neatly. I hand-stitched the zip in which I usually do as I find it easier than machine stitching it. I even remembered to add hanging ribbons as I’m running short of skirt hangers! 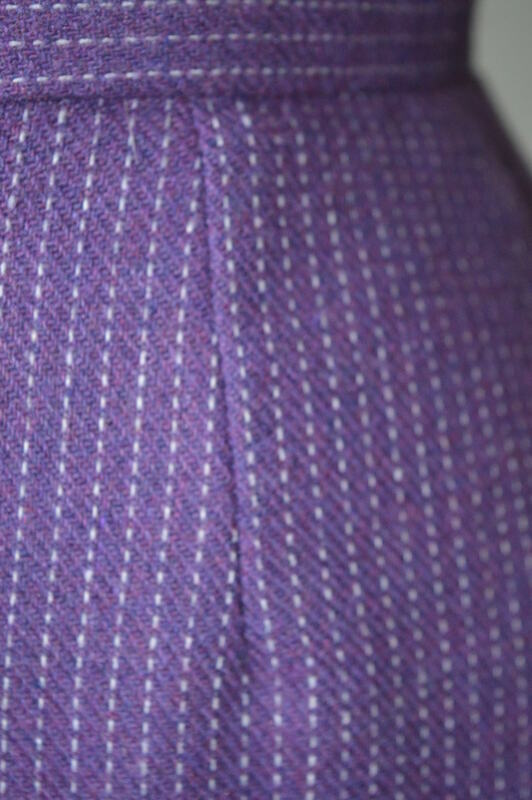 I had some wide purple bias binding in the drawer so I used it to make a nice flat hem, machine stitched with the blind hem stitch. I asked Helen to pin the hem length for me, she did make me laugh as she commented ‘Oh, you like your skirts quite short don’t you!’ she clearly thinks my long skirts are too short and my short skirts are too long! Teenagers!! I tried it on with my Jackie O jacket for the photoshoot but I’m not quite sure if the purples are close enough or if they just miss! I’ve got enough purple wool left to make a short skirt, but I think next skirt I make I really ought to choose a different pattern! 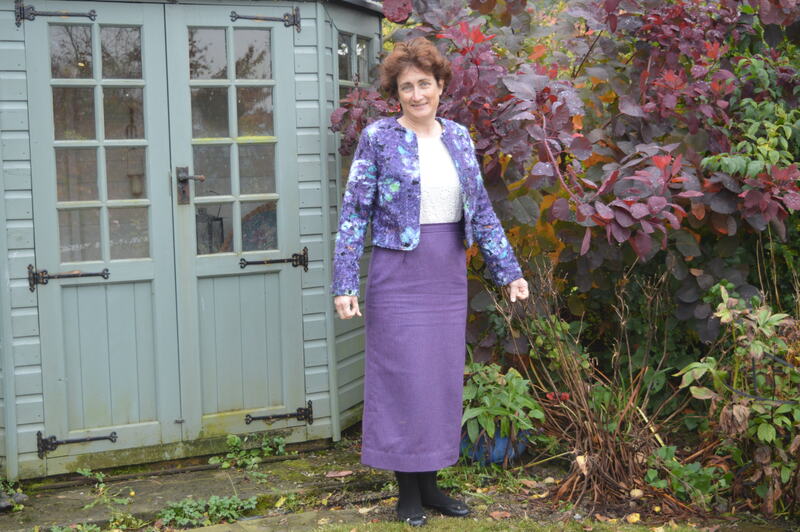 This entry was posted in Dressmaking, Serendipity, Sewing and tagged Burda 8765, Dressmaking. Bookmark the permalink.